Plaque is an invisible coating. It is a bacterial coating that forms on the teeth within a few hours after a meal. Within 24 hours, plaque starts to harden into calculus or tartar. How can I prevent tartar formation? After your dog’s teeth have been professionally cleaned, we would like to recommend a few steps which will help to reduce the process of plaque and tartar build up. Brushing of the teeth is another effective means of removing plaque before it turns into tartar. We recommend the use of a toothpaste made especially for dogs. This needs to be done at least twice weekly (preferably daily), but we know that not all dogs will tolerate it. Special brushes are made that make this task easier. 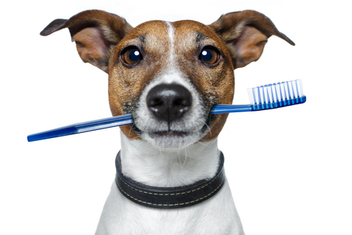 One way of getting your dog used to brushing the teeth is to dip the toothbrush initially in his dinner. Brush only the outside (buccal) surface of the teeth. The inner (lingual) surface of the teeth does not suffer from calculus build-up in same way as our teeth do because the dog’s tongue is a lot more mobile than ours and wipes the plaque away before it hardens to tartar. Feed your dog a commercial diet specially formulated to reduce tartar buildup. These have been formulated as a dry food and are composed of large pieces. Because the pieces are too large to be swallowed whole, your dog must chew them. These preparations contain fibres that literally scrape the plaque off the teeth without damaging the enamel. By removing plaque as it forms, tartar formation is greatly diminished. Hills t/d is a good example of a food that has been made specifically for preserving dental health. Use a “mouthwash” that is added to your dog’s drinking water or placed in the mouth. This type of product reduces the bacterial count in the mouth, resulting in improved breath and reducing plaque. There are also special patches that can be stuck to the inside of the lips that act similarly. Please consult us about these preventatives. Scaling and polishing the teeth under an anaesthetic every 6-12 months or at the first sign of tartar buildup can be very beneficial to most dogs. This will minimise damage to the gums and roots due to gum recession. Encouraging chewing of raw-hide or dental chew toys. Dogs which chew more tend to accumulate tartar more slowly.